Automotive Decorative Exterior Trim Market size was worth over USD 20 billion in 2016 and its demand is predicted to cross 500 kilo tons by 2024. Rising automobile production coupled with shifting consumer preference toward enhancing the aesthetics of vehicles will primarily drive the automotive decorative exterior trim market size over the forecast timeframe. Increasing demand for high-end luxury vehicles such as Ferrari, BMW, and Mercedes in several countries is stimulating the industry growth. Surging SUV sales owing to affluence level, rugged terrain, and large family sizes will influence the industry size positively. Technological advancement in material and manufacturing process allow vehicle accessories manufacturers to develop high-quality products in wide variants. Efficient manufacturing process allows good fit & finish of the product for external parts of the vehicle with reduced operational cost. Industry participants are investing in R&D to develop diverse budget products to cater distinct customers globally. Rising research activities will enhance the automotive decorative exterior trim market share from 2017 to 2024. Increasing internet penetration, consumer awareness, and availability of the technical information online are boosting “Do-It-Yourself” customers in major countries, driving the product demand. Surging disposable income, vehicle sales, and customization of the vehicle to enhance its aesthetic appearance is propelling automotive decorative exterior trim market size. Developing economies possess high growth opportunities owing to the low level of external modification rate in the vehicles. This will encourage industry players to focus on these regions to increase their revenue generations. Investments by automobile OEMs such as Mazda, Nissan, Honda, Volkswagen, and Toyota have increased business opportunities in respective countries. The product price varies as per the material and labour charge. These factors increase the complexities and costs associated with product maintenance, replacement and may restrain its adoption during the forecast period. Around lamp will account for over USD 9 billion till 2024. Improvement in vehicle aesthetics along with superior fit and finish will influence the industry positively. Higher preference of OEMs toward chrome material and enhanced finish of the product will further support the industry dominance. Daylight opening is estimated to acquire nearly 15% volume share in the automotive decorative exterior trim market till 2024. Shifting preference of vehicle manufacturers toward providing a smooth functioning of their products will further escalate the revenue generation till 2024. Passenger cars are anticipated to exhibit over 4% CAGR between 2017 and 2024 owing to their substantial production globally. Car owners prefer enhancements in their vehicle to make them more personalized. Product manufacturers are involved in developing the decorative trim and supplying directly to the vehicle OEMs. Additionally, manufacturers are indulged in long term supply agreement with the vehicle OEMs. 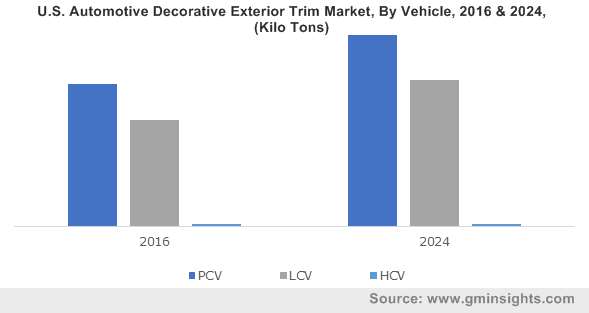 Automotive decorative exterior trim market share from light commercial vehicles is expected to surpass 60 kilo tons till 2024 owing to high product usage in windows and doors. High demand for utility trucks, vans, etc., coupled with the high usage of plastics in the manufacturing of product for these vehicles will further strengthen the product penetration over the coming years. OEMs are expected to reach USD 19 billion over the forecast period. OEMs install these products while manufacturing vehicles and supply the components to workshops and garages for replacement purposes. Insurance and warranty offered by OEMs will significantly contribute toward the industry dominance over the coming years. Manufacturers are focusing toward delivering the exterior trims developed with high-quality materials resulting in minimal chances of damage. Moreover, the manufacturers collaborate with vehicle repairing outlets for increasing their sales, supporting the industry growth till 2024. Significant growth of aftermarket in the industry can be attributed to the rising accident rates and low product cost worldwide. These trims are susceptible to damage due to accidents and unsuitable weather conditions, thus escalating the replacement needs, positively influencing the aftermarket revenue share. Aftermarket demand is highly dependent on customers’ preferences towards quality and cost. Cost-effectiveness is another advantage that will foster the industry growth over the projected time span. 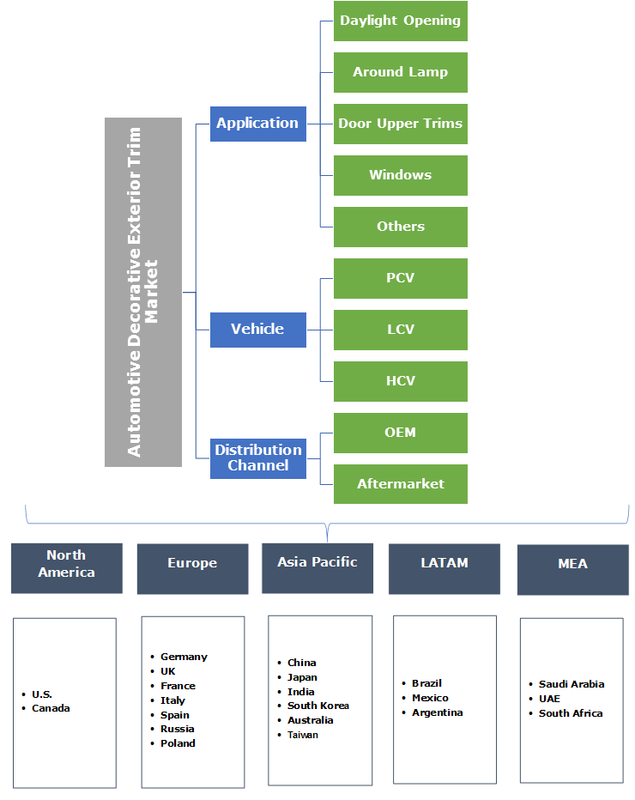 Asia Pacific automotive decorative exterior trim market size is projected to account for major revenue capturing over 40% by 2024. Substantial vehicle production across the region, especially in developing countries including India, China, and Indonesia will primarily drive the industry growth over the forecast timeframe. Rising demand for improving aesthetics of the vehicle among consumers will further create positive impact on the industry. Europe is mainly led by Italy, Spain and Poland exhibiting significant growth rate during the forecast timeframe. Industry players are engaged in research activities to enhance the product by improving the quality of raw materials used. Europe automotive decorative exterior trim market share is likely to witness a growth of over 4% from 2017 to 2024. Automotive decorative exterior trim market participants are Altuglass International, CIE Automotive, MVC, Takata, Trinseo, Magna International, Dura Automotive systems, and SRG Global, Inc. Manufacturers operate in a highly competitive environment competing at both OEM and aftermarket levels. Continuous innovations in materials, design, and manufacturing processes intensify the industry rivalry. Manufacturers are engaged in M&A activities for their product growth and regional expansion. Product manufacturers operate with OEMs, tier-1 suppliers, and independently to establish themselves in the automotive decorative exterior trim market. Manufacturers are implementing various marketing strategies that includes social media marketing, print media, and automobile exhibition to increase the product penetration and consumer awareness thereby boosting the product demand. Various dealers of the product creating their own brand with a range of accessories are expected to further increase the competition during the forecast period. Increasing focus on car aesthetics and improving comfort are stimulating the product demand. Propelling trend of customizing vehicle owing to the vast availability of products to match customer specifications and preference will support the automotive decorative exterior trim market growth. Manufacturers are majorly focusing on using low weight raw material such as plastics instead of metals for the vehicles owing to benefits such as cost-effectiveness and easy moulding into various shapes. Moreover, plastic is easier to paint than its counterparts. These benefits have resulted in a high usage of the product thereby escalating revenue generation.